“If I sound like I have a little anger in my voice, it’s because I do,” said Lawton. “I am absolutely sick of women being treated like a special interest group.” The Madison protest and others around the nation took place as a bipartisan group of anti-abortion senators prepared to offer a similar amendment in that chamber. 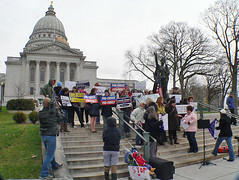 Rally organizers told opponents to contact Wisconsin Senators Herb Kohl and Russ Feingold and urge them to oppose any such amendment in the Senate version of health care reform.